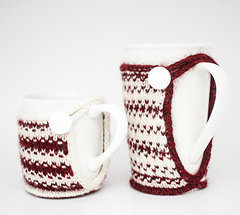 A coaster and a mug warmer all-in-one! 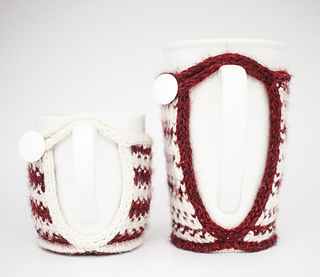 Keep your table protected and your beverage warm with the stylish Holiday Mug Shrug. 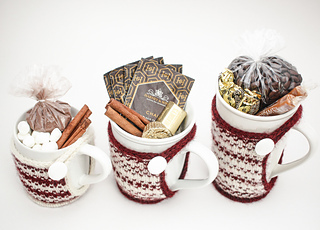 A fun and unique gift for any hot beverage fan! This makes a great gift! In fact, the last pattern page is all about gifting it with lots of helpful ideas! 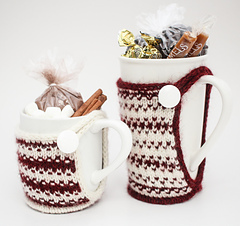 The Holiday Mug Shrug incorporates “faux” Fair Isle. The colorwork pattern is created by knitting with just one color of yarn and strategically slipping sts. 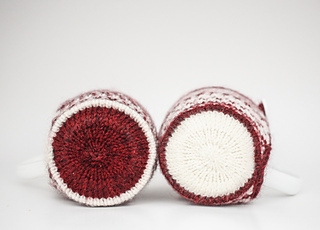 No fumbling with two strands of yarn. Simply follow the easy instructions and watch the colorwork unfold! First knit the base and the decorative welt in the round. Then, knit the sides flat and finish off with the I-cord edging and button loop. This pattern includes both charted and written instructions. Techniques used: Knit, purl, working in the round, increasing, slipping sts, picking up sts, i-cord BO. 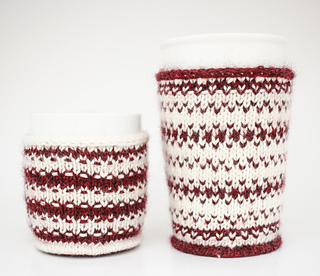 Note: Both the Stripes and Fair Isle versions can be knit in any size. 6 sts and 8 rows = 1 inch in St St, blocked.